We have been planning for so many amazing markets, events and special activities for the spring until the end of 2011. We will be having a featured artist working with attendees on artful meditation, another artist teaching us how to combine art and gardening. 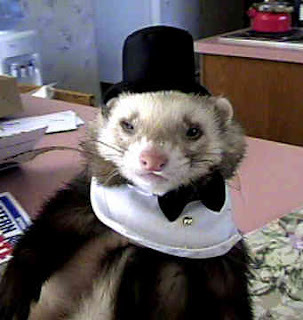 We are also excited about the upcoming market with fun themes that are certain to attract many of our fans, but what we are currently most pumped about is the Ferret Fair we are planning for May. Why a Ferret Fair? Well, as many of you may or may not know, Marie Antoinette had a large collection of ferrets that she brought with her from her homeland. She trained many of these ferrets to perform "circus type" acts and even had a mini 3 ring all-ferret circus once a year in her theatre at Versailles. We thought it would be so delightful to have our guests dress in Marie-inspired costumes and if you have a ferret, bring it along with you. If we can get enough ferrets together, perhaps we can have a little three ring circus of our own- much like what was done at Marie's Versailles. To top it off, we will have a notable ferret trainer for the day to teach you and your ferret the basics of: jumping through a small hoop, prancing on hind legs, and balancing on a ball. You will also learn some simple sign language for communicating effectively with your ferret. Finally, we will have a ferret costume maker on hand. She will teach you ways to dress your ferret in 18th century costumes- much like those that Marie would have dressed her ferrets in. Once we have the date finalized, we hope you plan to attend the first annual Ferret Fair. There will be nothing else quite like it anywhere in Madison. It could really turn into a 3-ring circus.